When I agreed to travel to Jackson, Tennessee, to speak to students, faculty, staff and community members at their Inaugural Leadership Conference, little did I know what was in store for me. In addition to the warm reception, the local TV news coverage and the camaraderie from my long, lost friend, the president of Lane College, Logan Hampton (who was my student activity leader when I was a freshman at Texas Christian University); beyond the keynotes, fireside chats and priceless interactions with students and their adult leaders, there were a couple of gems that I uncovered while traveling to and from Jackson, Tennessee. You see, Jackson is about a 90 minute drive from the nearest airport that supports large aircrafts. So in our case, that was the Memphis airport. This sojourn resulted in my making two new friends: Chief Joy, my security detail and driver who happened to be the campus police chief (who is working on his PhD), and the guy I spent most of high school and college watching on television as Dewayne Wayne’s best friend and partner in crime, Ron Johnson, whose real name is Darryl M. Bell–the actor from the hit TV show A Different World. This sitcom is underrated. It is one of the reasons we know the term “Must See TV” and what helped Thursday night become one of the most coveted time slots for any television series. Darryl and I had spoken once before via Zoom to go over what we might say once we arrived at Lane, but arguably, it was the drive from Memphis to Jackson that jumpstarted our friendship…oh yes, and Chief Joy. Chief Joy tried his best to remain silent and “professional” throughout our drive to Jackson. After all, his job was to retrieve us, keep us safe and ensure that we were deposited with a smile at our destination. But he was conflicted for a couple reasons– 1). Chief Joy is also a member of Alpha Phi Alpha, the same fraternity as Darryl, and also, the brother organization to my sorority, Alpha Kappa Alpha. 2). Darryl is very funny, and well, Chief also discovered a bit about my wit as well. There were instances where he broke all decorum and just had to laugh. Needless to say, the drive up was not only amusing, but informative. I learned more inside scoop on my favorite show ever in time, A Different World, than I ever expected. You can learn some of what I did by tuning in to The Culture Soup Podcast™ when we replay our fireside chat at Lane. I also hold this show dear as a true culture shifter. It’s layered and complexed portrayal of my people has yet to be matched. It’s ability to make everyone (despite color) consider tough topics while we laughed and rooted for the ensemble cast is also unmatched. And it is to this day, the only show that chronicled college life on an HBCU campus in a very real way. But it was the drive back from Jackson where Chief Joy and I and Darryl really bonded. Darryl had visited Lane College once before, and on his way back from the campus to the airport, wanted to visit the National Civil Rights Museum in Memphis, but ran out of time. While I was on the phone with my daughter, the two frat brothers agreed that we had enough time this time around to make the detour. Once off the line, they let me know their plan, and I enthusiastically joined in on the plan to visit. And just as we rounded the corner, there it was. The iconic sign that became synonymous with the grief of a people. It was our grassy knoll, right before our eyes. Someone had the inspired idea to build a museum around the room that was the setting for the last moments of Dr. Martin Luther King, Jr’s life. Can we pause for a moment of silence? I wasn’t ready. You can never be. 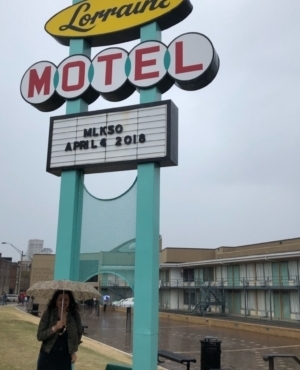 There were lines and lines of people waiting in and out of the rain to obtain tickets to file in and see the Civil Rights movement within the context of his death…what literally led up to and culminated with his last breath on the balcony. With only 45 minutes to get in and out of the venue, Chief Joy worked some magic. He let the museum know that he was escorting an icon–the actor from A Different World, and the staff there rolled out the red carpet laced with the blood of our ancestors—which led us through the Jim Crow era when the KKK wreaked terror on our people, to the bus boycotts in Montgomery with Rosa Parks–to the integration of public schools, to the lunch counter sit ins across the country–the Birmingham jail where Dr. King penned that poignant letter, to the plight of the Freedom Riders, to the march across that bridge in Selma–and ultimately to the March on Washington and of course what brought Dr. King to Memphis in the first place–the mistreatment of the sanitation workers. I’ve written enough. I’m going to all the pictures to tell the rest. I’m grateful for this unexpected experience with my brothers–the two gems I discovered on the way to Lane College–and I will never be the same after what we experienced together. Thanks, Lane College. What an experience!